At OMS, we use production lines by SALVAGNINI, which serve as an automated centre for the production of sheet metal luminaire housings. The production line comprises two separate parts interlinked with conveyors that communicate with each other over a network. The first part consists of a shearing centre, in which holes are made in sheets cut according to the desired shape. To do that, we use about 60 different cutting tools readily available in the cutting head. 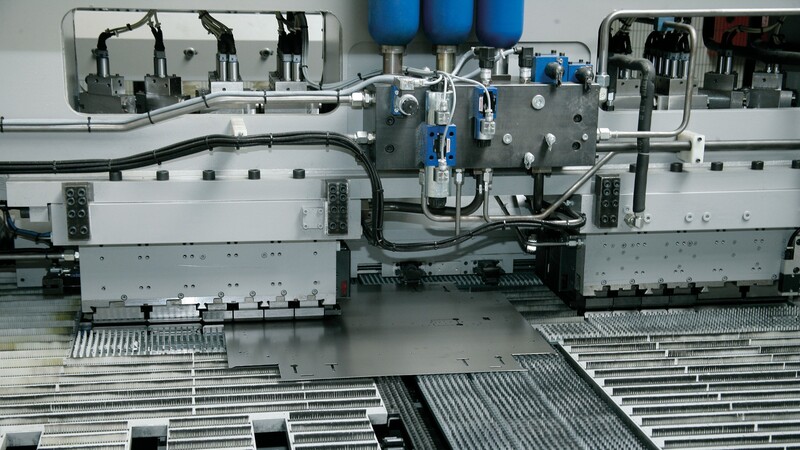 Thus, the semi-finished product automatically passes to the other part of the line – a bending centre. The machine positions and bends parts based on preset programmes. At the end of the process, the luminaire housing is bent into the desired shape. The only additional operation is spot or laser welding. No welding is involved in housing for the economical Unolux series. On this production line, the housing’s design is adapted so that the work is completed during the bending operation. At present, OMS operates three such production lines and processes approximately 250 tons of sheet metal per month, with minimal human resource requirements; only one operator is needed to control the entire production line. The CAD data coming from the R&D centre serves as the input for production, which our engineers and programmers make into a programme that these machines understand. The SALVAGNINI CNC programming machines are a great asset for us in mass production, as well for the creation of customised solutions. Rapid reprogramming of machines allows us to be very flexible and productive in our relationships with customers.